Soak up some sun in the elegant Agan V vacation apartment located right in the heart of Jerusalem’s historic city center. Situated in a brand new building constructed from Jerusalem Stone, exploring the city on foot is easy. You’ll find excellent dining, nightlife, shopping and attractions right at your doorstep. 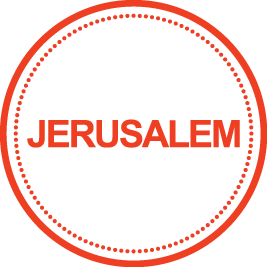 Many of the most famous sights are a short stroll, including the Old City (20 min), Mamilla Avenue (15 min) and the Mahane Yehuda Market (10 min). Bus and light rail stops are just down the street (3 min). Guests seeking upscale lodgings in an ideal location will especially love the stunning views from a high balcony drenched with sun. It’s easy to whip up a great meal with fresh local ingredients in the fully equipped kitchen, and our local interior designers carefully chose a comfortable yet artistic decor that reflects local traditions. Two bedrooms and a single fold-out sofa sleep up to 5 people comfortably. Premium amenities include a Nespresso machine, free WiFi, cable TV, hotel beds and linens, and high-end toiletries. Ideal for families or groups of friends, this vacation apartment is the perfect place to explore the best of Jerusalem!